Sh. Mohinder Singh Ji, Sanyojak Chandigarh Branch said that on the 3-day 49th Annual Nirankari Sant Samagam of Maharashtra, 145 couples tied their nuptial knots.Addressing the concluding session of the Samagam, Nirankari Baba Hardev Singh Ji Maharaj called upon the participants to carry the sweet fragrance of love and unity which they established in Kharghar during these 3-days to their respective places and spread the same in their areas. For this they must make God as the basis because ‘God is Love and Love is God’. Baba Ji said that all human beings are the creation of the One from the same five common elements with the same particle of the Over Soul i.e. Soul existing in everyone. No doubt they differ in their appearance, but basically they are one. And this Oneness will continue to prevail when we unite with One and make Him as the base of every aspect of our life. When we fight in the name of religion, caste, creed and culture, it means we have not taken God with us. People of one religion will fight with the other so long as they do not know and unite with God, the source of love.Baba Ji said that we can make our line bigger without removing the line of others. So, if we want to build bridges of love, we can construct over bridges even without dismantling the walls of hatred. The walls will cease to divide people or stopping them to meet each other. Love will make everyone truly religious, a true follower of his own religion. Earlier in the concluding session on Sunday was marked by a multi-lingual poetic symposium and its subject was ‘Nafrat Vair Ki Tod Deewarein, Pyar ke Pul Banatey Jayen”. More than 15 poets in Marathi, Hindi and Punjabi languages read their poems in this symposium. 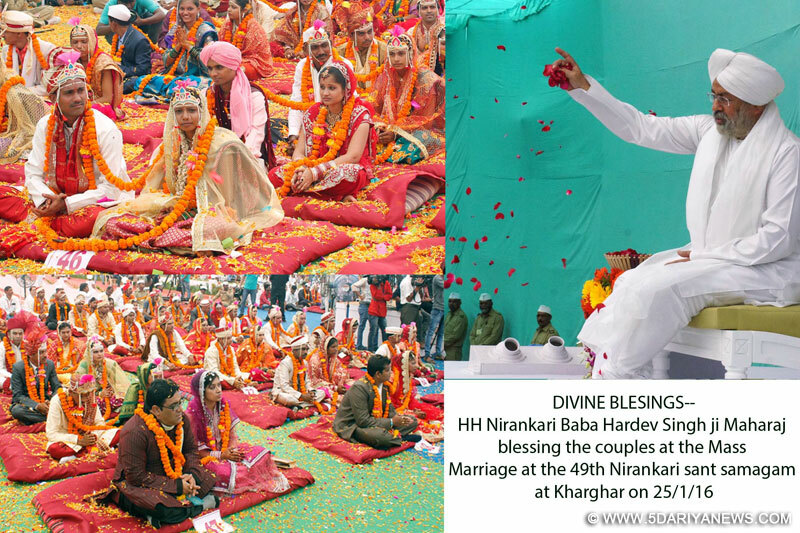 145 couples tied their nuptial knot at the mass wedding function organized at the Samagam venue in the presence of His Holiness Baba Hardev Singh Ji Maharaj and large number of devotees. While 55 bridegrooms and 61 brides belonged to Mumbai, 83 and 75 of them, respectively came from other parts of Maharashtra. Three bridegrooms came from U.P., two from Gujarat and one each from Kerala and Rajasthan. Similarly, 7 brides belonged to U.P. and two came from Gujarat. Interestingly, 17 bridegrooms and 22 brides came from outside the Mission but preferred this ceremony. One bride happened to be physically challenged while the bridegroom had normal health. As regards their educational qualifications, 28 bridegrooms and 32 brides were Graduates while 4 and 10 of them respectively were Post Graduates. In addition, 4 bridegrooms and 3 brides had done their MBA and one each their Postgraduate Diploma in Business Management. There were 6 Engineers among bridegrooms and 4 brides including one Post-Graduates. While one bride was a Law Graduate, 2 bridegrooms were doctors. And at the top of all, one bridegroom was Ph.D.Religion and caste is no consideration in Nirankari weddings. In fact, there was no such column in the proforma they filled in. The simple ceremony began with the traditional ‘Jaymala’ followed by the common garland for each couple, a special feature of a Nirankari marriage. It symbolizes the spirit and unity between the two – two bodies with one soul. ‘Lavan’, the four sacred Hymns were sung with music, each followed by the showering of flowers by His Holiness and devotees attending the ceremony. The ceremony concluded with the divine blessings of His Holiness. He said that it is a unique feature of Mumbai and Maharashtra that such a large number of couples assemble a day after Samagam in the Mass Wedding function. These families, brides and bridegrooms are guided by the values they are taught in congregation. Here, parents and relatives join Sadh Sangat and share their happiness with such a large family. Otherwise, they could organize the ceremony individually also but not in the presence of such a large number of devotees.Baba Ji said that the qualities of love, respect, humility, submission and tolerance etc. are not important for the couples only but other members of the family also. Only then, we can all be happy at the family level.Baba Ji mentioned that some of the brides and bridegrooms had come in their Sewadal uniform. I have seen them going for duty immediately after the ceremony, he said. This spirit of service is seen only here and nowhere else.